Groundbreaking has finally begun on the upcoming project once known as New Mizner on the Green. 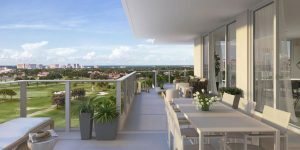 Now known as ALINA Residences Boca Raton, this new, scaled down project will consist of a trio of buildings each standing nine stories tall with a total of 382 units. The first tower will be comprised of 121 units with prices starting at $1 million while the second and third towers will begin development after a year after completion of the first tower. When it was still in the planning stages, ALINA Residences was originally going to become one of, if not the tallest building in all of Boca Raton, aimed at those seeking unmatched vistas of the Atlantic Ocean and the Intracoastal Waterway. The new ALINA will stand on close to nine acres of land and it will include a number of amenities including reflecting pools, a game room, and a fitness center. Future residents can rest assured that the upper floors will still have oceanfront views. The units of ALINA Residences will have one to four bedrooms with 1,400 to over 4,800 square feet. Private terraces and dens are among the residential features while the first floor will feature “villa” style residences that will have direct street access, somewhat similar to the brownstones found in New York. This update is by Polly Schiff, luxury residential properties specializing in Boca Raton as well as Delray Beach, Jupiter, Highland Beach, and many others. Polly has more than three decades of experience as one of South Florida’s most admired Realtors and she has been ranked among the top four percent of Realtors at Coldwell Banker Global Luxury International. For more information on Boca Raton real estate or any other buying or selling needs, please call 786-348-5878.